The Iconic game of 2018 "Red Dead Redemption 2" was a strong Single player campaign replied to all those gamer's who thought that single player games are over. Red Dead Redemption 2 is a masterpiece in every terms and aspect of the game. The highly detailed world of Red Dead Redemption 2 is such that losing your way is very simple, the sheer beauty of the game will keep you away from those main missions and would adhere you to explore the world. As you all know Rockstar Games are a big fan of Easter Eggs and mysteries, we already saw that In their previous title Grand Theft Auto 5. The same goes for RDR 2, as its one of the most detailed game ever created in the gaming history. There are tons of mysteries, Easter Eggs and other random encounters which you may have missed, but you needn't worry as I have got everything covered. - Legendary horse and many other topics. So, to stay updated on everything related to Red Dead Redemption 2 by following me on Sportskeeda. Now without any further ado, let's continue towards our topic. 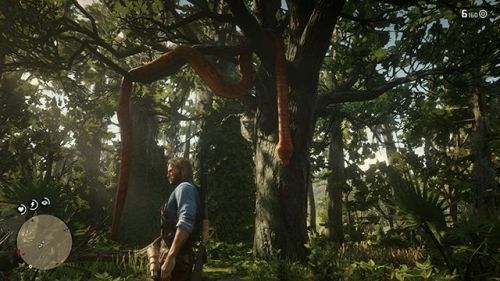 Players in Red Dead Redemption 2 can find a Jungle Book reference in the game if they visit a location near the Big O of "LEMOYNE" written over the main map of the game. 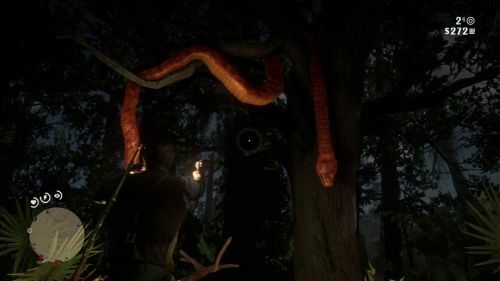 In the West of Lagras in Red Dead Redemption 2 at the marked location in the above image, you can find "KAA" the giant snake from jungle book. First introduced in the story "Kaa's Hunting" in The Jungle Book, Kaa is a huge and powerful snake, more than 100 years old and still in his prime. Do you know what happens if you shoot the snake? or throw a Firebomb? Well, don't waste your time! Run your game and use our guide to visit the location and check out what happens. If you have any problem in finding the easter egg location comment below and we will help you.